More than a decade ago, PNP's Founding Scientists discovered that the expression of E. coli purine nucleoside phosphorylase (E. coli PNP) in a small percentage of the cells within a solid tumor can be exploited to selectively kill the entire tumor mass. This is achieved by coupling the locally-produced PNP enzyme with a prodrug that is metabolized into an active chemotherapeutic agent with high levels of tumor killing effect. The Company's first product configuration to take advantage of this approach pairs E. coli PNP and fludarabine phosphate (F-araAMP), a chemotherapeutic agent already in clinical use worldwide. At present, F-araAMP is approved by the FDA for the treatment of chronic lymphocytic leukemia (CLL), but this agent has not been shown to be active in the treatment of solid tumors. 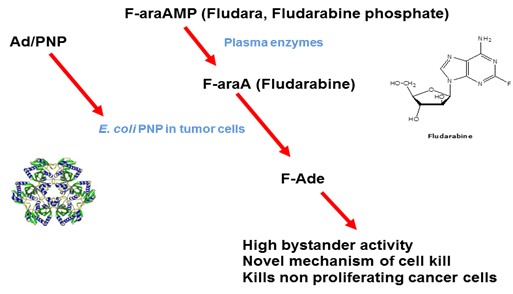 The PNP enzyme converts F-araAMP into fluoroadenine (F-Ade), a new metabolite with very potent tumor killing activity. By coupling the administration of F-araAMP with the selective expression of E. coli PNP in the cells of solid tumors, PNP Therapeutics has dramatically expanded the spectrum of anticancer activity of this chemotherapeutic agent. The PNP therapeutic approach derives its advantage from the fact that most conventional anti-cancer drugs achieve anti-tumor specificity as a result of their ability to kill rapidly dividing cells. In fact, these drugs are only suitable for systemic administration because they are most toxic to cells that are actively dividing, which includes a sub-population of cells within the growing tumor mass. This leads to an acceptable level of damage in other, rapidly proliferating tissues (cellular compartments such as the bone marrow, intestinal tract, and hair follicles are most commonly affected). However, many refractory tumors are intractable precisely because they have a very low growth fraction; that is, a relatively small percentage of the tumor mass (4 to 40%, typically) is made up of cells that are actively dividing at any particular point in time. The E. coli PNP Therapeutic System has been shown to be effective against these refractory tumors precisely because fluoroadenine, the active metabolite in the Company's first product configuration, attacks and kills both the dividing and non-dividing cells which, unlike most other anti-tumor agents, destroys the non-proliferating component of the tumor. Most importantly, this is accomplished while limiting/localizing the patient's exposure to the anti-cancer agent.